Ben Bradlee, executive editor of the Washington Post from 1968 to 1991, led the newspaper through its publication of the Pentagon Papers and the Watergate scandal. Before joining the Post, Bradlee worked for Newsweek as a foreign correspondent and as the Washington bureau chief. He had a close friendship with President John F. Kennedy, which he wrote about in two books. 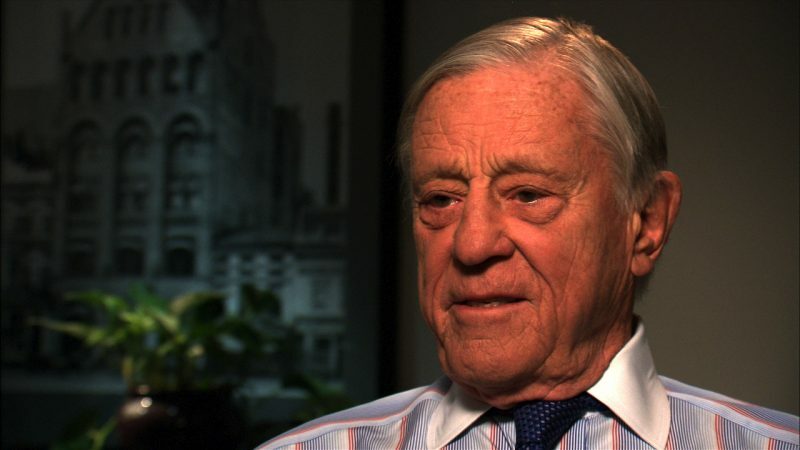 Ben Bradlee addresses the challenges of covering national security issues. “That Special Grace.” Philadelphia: Lippincott, 1964. “Conversations with Kennedy.” New York: Norton, 1975. “A Good Life: Newspapering and Other Adventures.” New York: Simon & Schuster, 1995. Bradlee, Ben. “A Good Life: Newspapering and Other Adventures.” New York: Simon & Schuster, 1995. Interview with Charles Lewis at The Washington Post in Washington, D.C., on April 25, 2007. “Free Speech: Jim Lehrer with Ben Bradlee.” PBS NewsHour, June 10, 2006. Bradlee, Ben. “The Bradlee Files.” Newsweek, Sept. 25, 1995. 2 Bradlee, Ben. “A Good Life: Newspapering and Other Adventures.” New York: Simon & Schuster, 1995. 3 Bradlee, Ben. “A Good Life: Newspapering and Other Adventures.” New York: Simon & Schuster, 1995. 4 Bradlee, Ben. “A Good Life: Newspapering and Other Adventures.” New York: Simon & Schuster, 1995. 5 Bradlee, Ben. “A Good Life: Newspapering and Other Adventures.” New York: Simon & Schuster, 1995. 6 “Free Speech: Jim Lehrer with Ben Bradlee.” PBS NewsHour, June 10, 2006. 7 “Free Speech: Jim Lehrer with Ben Bradlee.” PBS NewsHour, June 10, 2006. 8 Bradlee, Ben. “A Good Life: Newspapering and Other Adventures.” New York: Simon & Schuster, 1995. 9 Bradlee, Ben. “A Good Life: Newspapering and Other Adventures.” New York: Simon & Schuster, 1995. 10 Bradlee, Ben. “A Good Life: Newspapering and Other Adventures.” New York: Simon & Schuster, 1995. 11 Bradlee, Ben. “A Good Life: Newspapering and Other Adventures.” New York: Simon & Schuster, 1995. 12 Bradlee, Ben. “A Good Life: Newspapering and Other Adventures.” New York: Simon & Schuster, 1995. 13 Bradlee, Ben. “A Good Life: Newspapering and Other Adventures.” New York: Simon & Schuster, 1995. 15 Bradlee, Ben. “A Good Life: Newspapering and Other Adventures.” New York: Simon & Schuster, 1995. 17 Bradlee, Ben. “A Good Life: Newspapering and Other Adventures.” New York: Simon & Schuster, 1995. 20 Bradlee, Ben. “A Good Life: Newspapering and Other Adventures.” New York: Simon & Schuster, 1995. 23 “Free Speech: Jim Lehrer with Ben Bradlee.” PBS NewsHour, June 10, 2006.